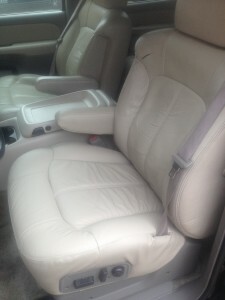 Here’s the deal…Today we did a driver bottom leather seat cover and arm rest cover install on a 2002 Chevy Tahoe. 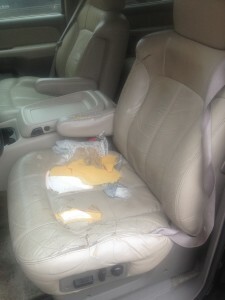 The customer also replaced his foam cushion with a new DuroFoam replacement from The Seat Shop. Replacing this foam cushion will make the new leather seat cover wear properly and last a whole lot longer. Below are the before and after pictures. If you have any questions about factory match replacement leather seat covers, give us a call at 214-710-2565, or visit us on the web at www.theseatshop.com.